Rohan Bopanna and his parter Pablo Cuevas have been knocked out of the Madrid Open, their second consecutive first-round exit on the ATP World Tour. 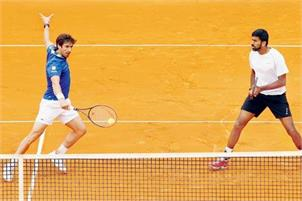 Bopanna and Cuevas lost their opening match of the elite clay court event 3-6 2-6 to Fabrice Martin and Daniel Nestor. They had also made a first round exit at the Barcelona Open, where they had lost to Henri Kontinen and John Peers. In the 54-minute match, Bopanna and Cuevas lost serve four times and managed to break their rivals one time. With Bopanna's tame defeat, India's challenge has ended at the Euro 6,408,230 clay tournament.